SpaceX's Falcon9 rocket booster lights its engine as it makes its landing (left side), while the second stage of the rocket powers the satellite into space (right side). 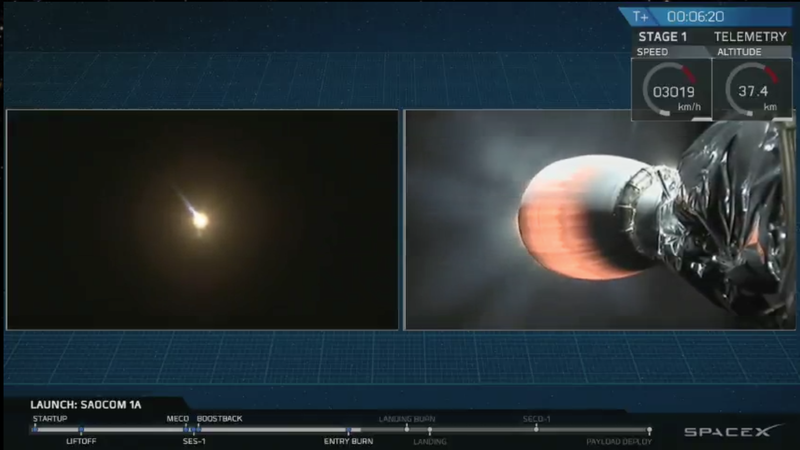 Image: SpaceX. SpaceX launched a satellite for Argentina's space agency on Sunday evening and successfully landed the first stage of a Falcon 9 rocket at its West Coast facility at Vandenberg Air Force Base in California. This was the company's first-ever dry-ground landing on the West Coast, at a launch pad that had previously been used by the Air Force dating back to the 1960s. Why it matters: To date, SpaceX has been launching and recovering Falcon 9 rocket boosters at sea on the West Coast, but this was the first time it has recovered a rocket on land there. The milestone means the space company has more flexibility to operate on the West Coast, launching payloads to a greater variety of orbits. Previous land recoveries had taken place at Cape Canaveral, Florida. Landing and reusing rockets is key to SpaceX's goal of reducing the cost of access to space. Other companies, such as Jeff Bezos' Blue Origin, are also pursuing similar strategies of rocket recycling.